Family Agariciidae, Gray 1847. All utilize endosymbiotic algae, all colonial. Individual coral polyp skeletons have poorly formed walls, prominent/thickened septo-costae, are immersed in their larger skeletal mass, randomly oriented, spaced, often resembling rough, wrinkled skin. Six living genera. Agaricia agaricites (Linnaeus 1758). Form complex relatively thick layers of connected bifacial fronds. Upright or encrusting/horizontal. Agaricia agaricites forma agaricites (Linnaeus 1758). Encrusting colonies of discontinuous reticulated patterns of ridges and valleys. Roatan 2019. Agaricia agaricites forma danai (Linnaeus 1758). Form complex relatively thick layers of connected bifacial fronds. Upright or encrusting/horizontal. 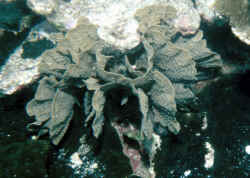 Often with algae growing at base. One "forma danai" in Bonaire. 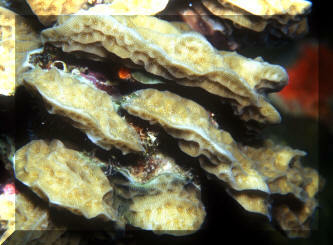 Agaricia grahamae, Graham's Sheet Coral. Looks like thin sheets to thick plates, often as piled up shingles on a sloping reef. Distinctive polyps appear star-like in valleys. Septa and valleys are equal in size (Lamarck's are dissimilar in thickness and height). Bahamas pix. Second pick, Graham's on left, Lamarck's on right for comparison. Agaricia lamarcki Milne Edwards & Haime 1851, Lamarck's Sheet Coral. Colonies are flat one-faced plates arranged in whorls. Bright white polyps. Dissimilar septa size and wider spacing compared with A. grahamae. Usually brown rust in color with whitish mouths. Belize images.